On my 1990 visit to Japan, I spent a little time in the Osaka Transportation Museum. The only things I found of interest relative to monorail were these two engineering study models, built in the 1960s. 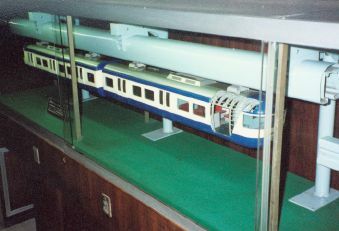 The first was presumably made for the Inuyama Monorail, the first full-scale Alweg monorail in Japan. 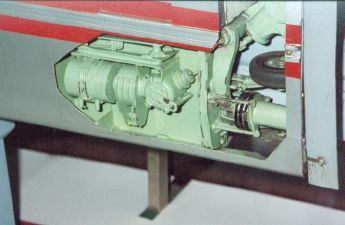 Interiors are complete on the model and as you can see below, under-the-skirt details were modeled as well. 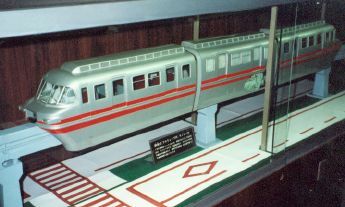 A Mitsubishi model of a 1960's SAFEGE monorail is on display as well. Note that the train and track are far more similar to the original SAFEGE test track in France than that of the Shonan and Chiba City monorails that were later built by Mitsubishi.